Translators Wanted: Seoul Selection is looking for translators in 10 languages – Vietnamese, Bahasa Indonesia, Thai, Bengali, Uzbek, Urdu, Sinhalese, Burmese, Khmer and Nepali – for a health-related translation project. If you’re interested, send a resume to atoz@seoulselection.com. Inquiries can be sent to the same address. Don’t miss a rare chance to see the work of the late Jejudo photographer Ara Art Center in Insa-dong is hosting a rare opportunity for Seoulites to appreciate the work of late photographer Kim Young Gap. 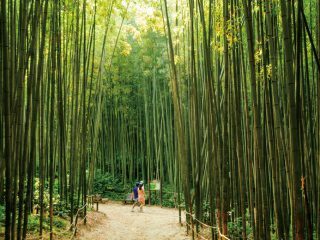 Mainland-born and lacking formal photographic training, Kim settled in Jejudo in 1985 and spent the next 20 years taking stunning panoramic shots of Jejudo’s breathtaking natural scenery. His dedication to his craft was unparalleled – he would spend hours, and sometimes days, waiting in the elements for the perfect light. Nobody has captured the beauty of the island’s windswept volcanic landscape better. In 2000, Kim was diagnosed with Lou Gehrig’s disease. Unable to pursue his craft any more, he spent the last five years of his life establishing the Kim Young Gap Gallery Dumoak in Seongsan, Jejudo. Marking the 10th year of his passing, this exhibit features about 70 of his photos, from his early work to his later panoramic masterpieces. It is the first large-scale showing of his work in Seoul. The Hangang River has a unique culinary culture. What do North Korean defectors think about K-pop? The many factors that led to Korea’s MERS crisis. Two popular bloggers are bringing K-Beauty to the world. The JoongAng Ilbo looks at the the big reed blind at the MMCA Seoul. Beautiful sunset seen from Mt. Guryongsan. Sheep and wind turbines at PyeongChang’s Samyang Ranch. Architecture starts from a longing for certain places. The utopian imagination that dreams of a better place is the driving force of architecture. Historically utopia provided an alternative to overcome reality in architecture as well. This was maximized through the vision of architects who strived to create new modernized cities after the World Wars. Throughout the nooks and crannies of Korea, which had to reconstruct everything from scratch, this utopian method of experiment was implemented in a bizarre way at an extremely rapid pace. Architects and politicians were all in the same boat, heading toward the ideals for developing the country anew. Some 60 years later, now that we are in the “era of diminished expectations” where desires for countless things are emasculated, how is the utopia conceived by our own architecture work? With what form and content will “Architopia” be filled, born as an ideal for the architects? These are the questions being posed to initiate this exhibition. The exhibition presents a layout to explore a specific reality that upholds a certain ideal called “architectural utopia”, rather than plainly introducing individual works. Hybrid elements like photos, drawings, videos, graphics and text are arranged with visual aptitude as if seeing a featured article in a magazine, emphasizing vivid reading experiences. Architects, photographers, critics and graphic designers who participated in the exhibition are image collectors and producers capturing the “Experiment of Architopia”, displaying the traces of utopia revealed at certain points in time. Korean Culture to the World will be hosting a free class – yes, a FREE class – on natural dyeing of Korean paper, or hanji, and making traditional book bindings using dyed hanji. The non-profit organization Korean Culture to the World’s free classes provide the depth and subtlety long-term residents crave, but are fun enough for new visitors as well. MORE INFO: Send an application with you name, age, gender, job and telephone number to kctw2558@gmail.com. Also see this website. GETTING THERE: Exit 6, Anguk Station (Line 3). Looking for a place to live, whether it’s an apartment or a villa in Seoul? Rent Korea has worked for the past 15 years helping expats with their housing sales and rentals. They make the housing process easy so you can relax. “Hyundai Card Culture Project 18_Young Architects Program 2015” is the architecture show at the National Museum of Modern and Contemporary Art, which is organised by the National Museum of Modern and Contemporary Art, Korea in partnership with the Museum of Modern Art and Hyundai Card. “The Young Architects Program” began in 1998 in the Museum of Modern Art, New York. It is a meaningful project that is committed to fostering young and emerging architectural talent by providing the opportunity to design and present their own projects. “The Young Architects Program” is a temporary outdoor installation that provides shade, seating, and water aiming to provide pleasant spaces for visitors during summer season. Since then, the project has expanded considerably with CONSTRUCTO in Chile joining in 2010 followed by the National Museum of XXI Century Arts of Italy the following year. The Istanbul Museum of Modern Art, Turkey also joined the international network in 2013 and continues to collaborate on the program. The National Museum of Modern and Contemporary Art, Korea joined the Young Architects Program international network in 2014. “Hyundai Card Culture Project 18_Young Architects Program 2015” will provide young architects with opportunities to enhance their capacity and let visitors enjoy creativity of young promising architects. The exhibition consists of three parts: the first part showcases winners and the finalists of 2015 YAP International; the second part shows the work of the four shortlisted teams and one winning team; the third part displays the works of architects who have been nominated for this year’s “Hyundai Card Culture Project 18_Young Architects Program 2015” at National Museum of Modern and Contemporary Art, Korea. The Seoul Pops Orchestra, the oldest pops orchestra in Korea, will hold a performance in celebration of the 70th anniversary of Korea’s Independence from Japanese colonial rule at Seoul Arts Center on July 14. Under the stewardship of chief conductor Ha Sung-ho, the orchestra will play a program that mixes genres of Western and Korean classical music, including Tchaikovsky Sym. No.4 Pops (I, II, IV mov. ), “My Heart Will Go On” from the “Titanic” soundtrack, selections from “The Barber of Seville” and “Korea Fantasia,” a mashup of folk song Arirang and the Korean national anthem. Pop singer So-hyang and three classical vocalists will make guest performances as well. GETTING THERE: Nambu Bus Terminal Station, (Line 3), Exit 5. Transfer to shuttle bus, or green bus No. 4429. The old Baekje of Buyeo is renowned for the beautiful lotus blossoms that grow at Gungnamji Pond, a lovely old pleasure garden that dates from the Baekje era. If youâ€™re going to visit this blissfully bucolic country town, this is the time to do it. As an added bonus, the historic sites of Buyeo were recently added to UNESCO’s World Heritage list. And be sure to try Buyeo’s famous yeonipbap – rice steamed in a lotus leaf – while you’re down there. Gyeongju, the ancient capital of the Silla dynasty, is without a doubt one of Asia’s most important and historic and archaeological sites. Known as the “museum without walls,” Gyeongju has been selected by UNESCO as one of the world’s most important ancient cultural sites, attracting visitors from all over the world to experience its wealth of legends, art, temples, and archaeological remains, along with its beautiful natural scenery. MORE INFO and GETTING THERE: See link. 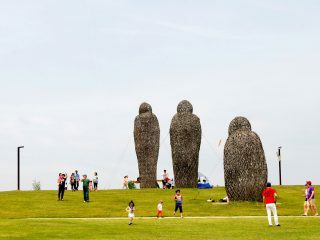 Choi Pyung-gon’s “Calling Unification” at Pyeonghwa Nuri Park, Paju. Photo by Robert Koehler.